Fair warning: this entry is not for the faint of eyeball. A few months ago, photography enthusiast and Redditor AlexisfromParis found a wooden box in a thrift store in Paris’ 15th arrondissement. The box contained approximately 50 glass plates of side-by-side stereographic pictures of France in the 1930s, and it came with a period stereograph viewer. Alexis took the box home and scanned the side-by-side stereograms. 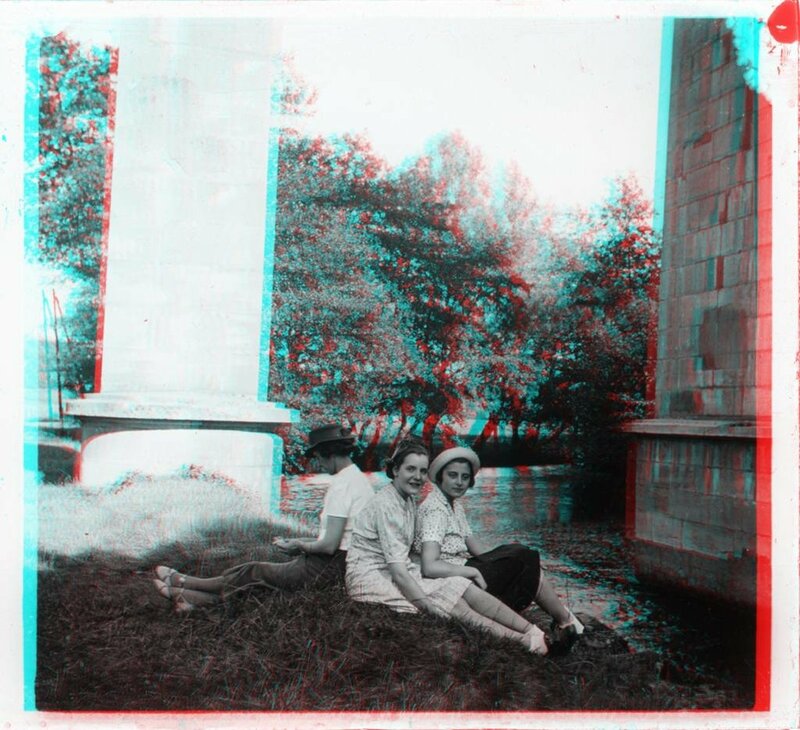 He converted them into anaglyphs, superimposed red and cyan images which when viewed through 3D glasses integrate into one image with the illusion of dimensional depth. Then, for those of us not equipped with 3D glasses, he combined the two slightly offset black-and-white images into an animated GIF that flickers like crazy, but if you can get past that does convey some of the depth you’d see looking through the stereograph viewer without having to use any external equipment. It’s as if Whistler’s Mother were sitting in a club while strobe lights illuminated the background. Here is Alexis’ gallery of anaglyphs. Here are the raw 3D side-by-sides. Here is the gallery of animations. The animation technique Alexis used is known as wiggle stereoscopy, for obvious reasons, and is a fun toy if you’re not prone to seizures or motion sickness. The New York Public Library has a nifty tool for people to create animated GIFs from the library’s massive collection of 40,000 stereographic pictures: the Stereogranimator. The Library of Congress has almost 9,000 stereographs from the Civil War available online. They don’t have a wiggle stereoscopy tool to make them dance, but they’re still fascinating to browse, and you can always put them together yourself in any photo editing software that creates animated GIFs (GIMP is free, although not what I would call intuitive).